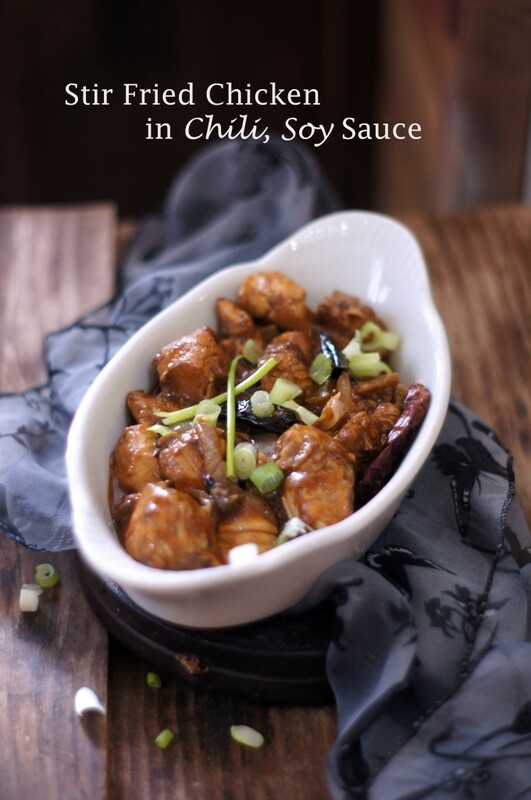 The dish gently reminds me of our favorite Chilli Chicken, the king of the Indo-Chinese cuisine. 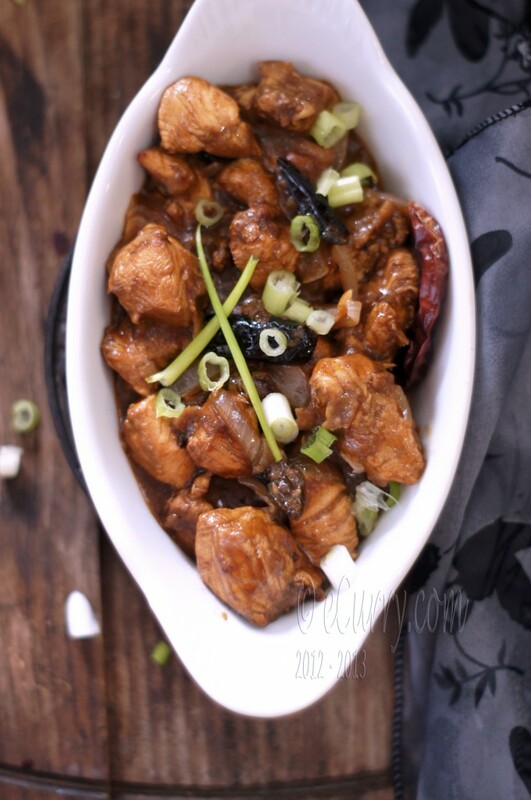 However it is a little less elaborate, lacking the subtle crunchy coating of the chicken and also the fresh flavors of the abundant green hot peppers used in the Chilli Chicken. Let us call it the “Almost Chilli Chicken“. The depth of flavors are a pleasure here, I promise; aroma of charred chili peppers, garlic, ginger, dark soy sauce and toasted sesame oil hug the quickly browned chicken. Have a side of Egg Drop Soup and serve the chicken over noodles or rice. At present, our minds are some place else. I am cooking a lot and trying to get ourselves very busy, just to get our mind off the pain and the void that my sister left us with. We can only make an effort to “move on”. The heart is heavy and full of questions we are trying to find answers to. Every breath hurts. Seeking help and consolation in philosophy and religion is probably the only way out during this time, but nothing, absolutely nothing takes away the heart wrenching pain and the emptiness. The posts in my blog might not be as consistent. So please bear with me for the next few months or until we get ourselves a bit more composed. Clean the chicken. Trim fat and wash them. Pat them dry with a paper towel. In a ziploc bag or a bowl combine chicken, vinegar, a tablespoon of ginger paste, a teaspoon of minced garlic, some salt, 2 teaspoons of Sriracha/hot sauce and let it sit for at least 45 minutes or more. Heat oil in a pan/wok. Add the cornstarch/corn flour to the marinated chicken and toss for the flour to coat the chicken pieces. Shallow fry the chicken (in a single layer) at high- medium heat for about 6-8 minutes or until the chicken is cooked through and the outside is golden brown. Remove with a slotted spoon and transfer on paper towels. Set aside. In a bowl combine tomato paste, Sriracha/hot sauce, tamari/soy sauce. In another bowl combine 2 teaspoons of cornstarch with 1/2 cup of cold water. In another pan/wok, heat 3-4 tablespoon oil. Add the dry red chili pepper to the oil and let it turn dark brown. Add the sesame seeds and let it turn golden brown. Now add the chopped onions, minced ginger and garlic and fry at high heat while stirring constantly, about a minute. Add the fried chicken and toss. Now add the contents for the sauce that you had combined in a bowl and the black pepper and cook while stirring and tossing the chicken, for a couple of minutes. Stir the corn starch/corn flour and add to the wok/pan and cook while tossing quickly and until the sauce thickens and coats the chicken pieces – for another couple of minutes. There should be some extra sauce left in the pan. The dish is not entirely dry. Stir in the toasted sesame oil. Remove from heat and garnish with sliced scallions. Serve with rice/noodles. October 23rd, 2012 | Category: Main, Entrees etc, Meat & Poultry, Sides & etc. That looks so good Soma. Perfect chicken dish for the rains here. Some peanuts and it would have become Kung-Pao chicken. Take it easy Soma. Wow Soma…sounds so delicious…Love the ingredients you have used for this dish. love your blog especially the story behind each recipe, the photos and your creative use of vocabulary.Always very excited to read new posts…thanks for sharing it! Looks delicious..a definite must try! This looks awesome Soma… Nice pictures!! Heartfelt condolences for your loss… as they say time heals all the pain. My prayers are with you. A bowl of rice and this and I’m all set! Thanks for the recipe. *Please take your time, we all adore your blog but we value your happiness first. Hope peace finds you. I can totally understand you have different things on your mind lately Soma. I hope all is well there and you’re coping as best as possible under the circumstances. Love this delicious dish! hi there. 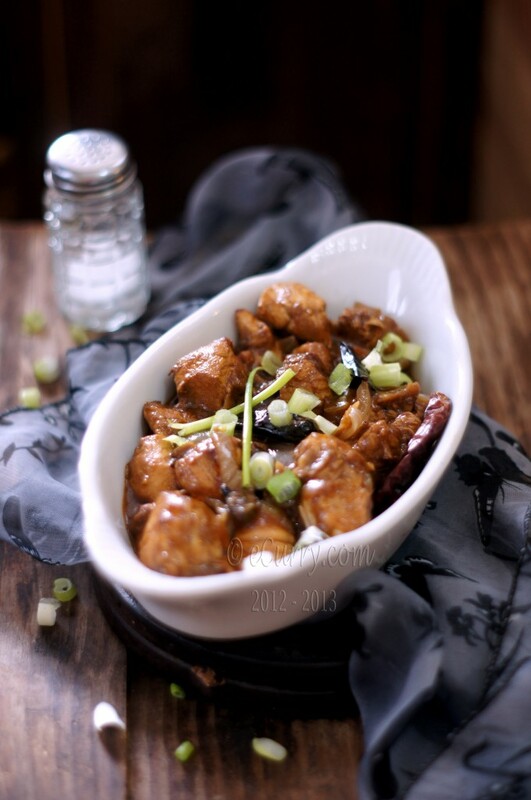 not sure if you respond to comments or even read them, but I am Chinese and would like to tell you a little secret about how to make your chicken soft the way the Chinese do it in restaurants. Perhaps you may already know this but baking soda is the secret. Marinate the chicken for 10-15 minutes in baking soda or any meat you desire, then rinse clean with water and then marinate with whatever seasoning and u will have extremely soft meat!! by the way your butter chicken recipe..AMAZING! I hope you’re a bit better now, Soma. Well, as better as you can be in such a short time. I was thinking about you the other day – being so far away from family makes a loss so much harder. I hope it’s healing a little every day. Love this dish! It was so good, and did taste a little different than typical Chinese recipes I’ve made in the past. The cornstarch also really makes the chicken tender. The onions are sweet and perfectly balances the spicy chicken. Its also a lot easier/healthier to pan fry the chicken than deep fry. Thanks for the recipe! Thank you so much for giving this a try and for taking your time to leave a comment. glad you enjoyed!